Our Air Plus layflat compressor hose is an all synthetic, heavy duty layflat compressed air hose complying with BS 6391 Type 3 and other international standards. 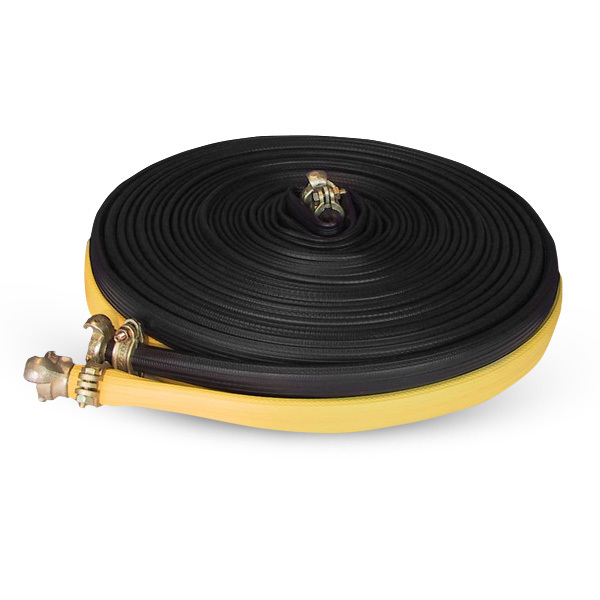 The hose is a high quality Nitrile-synthetic rubber which is extruded through the weave giving a ‘Unified’ construction. External ribs offer further resistance to abrasion and ease of handling. This hose requires no drying after use. The Air Plus layflat compressor hose is characterised by its heavy duty, high abrasion resistance and extremely long service life. Flexible and kink resistant structure produced with very low twist, it is a multipurpose hose suitable for a wide range of applications. The Air Plus layflat compressor hose is principally used in the construction industry, providing compressed air to power tools and machinery. Available in Black, Yellow and Red colours. RHL can provide the hose with European Compressor Couplings swaged or clamped.